Anahi ametrine is a form of quartz that emits incredible color zoning, combining purple amethyst and golden citrine into one gemstone. This color zoning phenomenon happens naturally and no two ametrines are alike. Both citrine and amethyst are forms of quartz and owe their colors to trace amounts of iron. Dual color zones in ametrine are the result of varying oxidation states of iron within the crystal. Such oxidation states occur during the formation of the crystal when temperatures fluctuate. Ametrine is also known as trystine and bolivianite, named for Bolivia as the origin of the stone. Felipe de Urriola y Goitia was a member of Spain's expedition to the West. 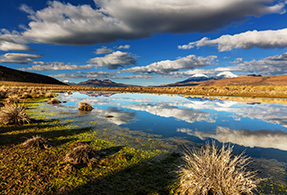 He contacted the peaceful Ayoreo tribe of Bolivia where he met Anahi, the chief's daughter and tribal princess. The princess fell in love with Felipe and the chief presented the ametrine mine as a dowry to her groom. When it was time for Felipe to return to Spain the princess chose to sail away with her husband. Her tribesmen felt abandoned and betrayed and they plotted to murder her. As she lay dying Anahi asked to see her husband one last time and presented him with this beautiful stone as a token of her eternal love. The stone's twin colors symbolize Anahi's heart torn between the love of her husband and the love of her people. The value of colored stones is typically determined by a combination of its color, clarity, cut, and carat weight. This is no different when determining what Anahi ametrine’s worth. These guidelines will help you choose apatite stones for your collection. 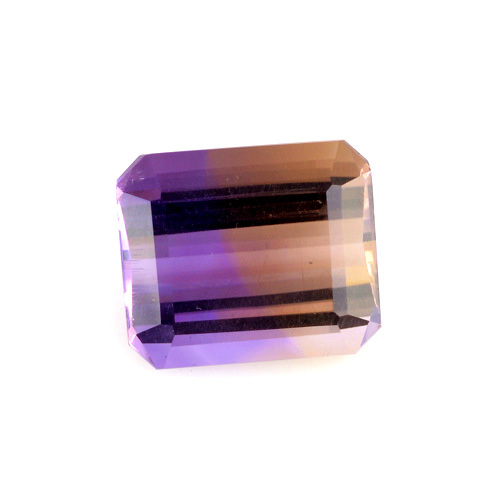 Fine ametrine shows medium dark to moderately strong orange, and vivid to strong purple or violet-ish purple. The colors of amethyst and citrine are produced by iron impurities with different oxidation states. Ametrine typically exhibits an abrupt color transition from purple to yellow; the stones with a half-and-half color split are the most popular and typically considered the most valuable. Ametrine comes from the family of quartz. Like all quartz stones, Anahi ametrine is typically eye-clean and transparent, and exhibits a captivating vitreous luster as a finished cut and polished gem. The emerald cut displays an attractive half-and-half distribution of each color, with a sharp boundary between the two colors at the center, perpendicular to the table of the gem. This cut is preferred by Shop LC’s skilled lapidaries to show-off the bi-color effect. Ametrine gems are also often fashioned into mixed or brilliant cuts. These are cut into "blended ametrine" that has random patches of amethyst and citrine and cannot be displayed with color distinction. Ametrine is also popular in free-form or fantasy cuts. Anahi ametrine may have a finite supply but the yield often provides large carat weights. Stones of five carats and above often display intensely saturated hues. Occasionally, Anahi ametrine undergoes a heating treatment. This treatment improves the color of the stone. This treatment is only detectable by trained gemmologists or labs when using specialized equipment. Anahi ametrine is a quartz, combining amethyst and citrine. With a Mohs hardness of seven, this stone withstands abrasions and scratches with ease, making is suitable for all jewelry types. Avoid abrupt temperature changes as it can cause ametrine to fracture. 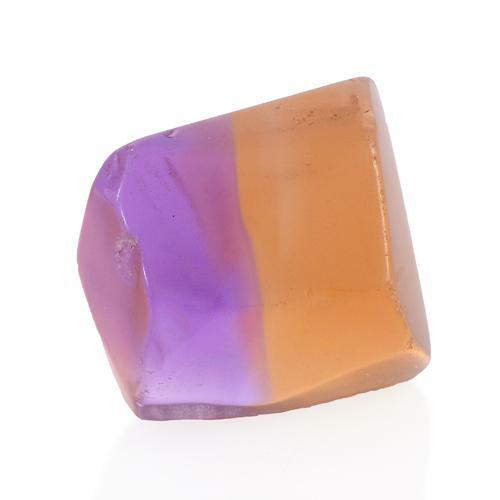 Some ametrine colors can fade with prolonged exposure to intense light. Ametrine can be safely cleaned with warm, soapy water. It’s recommended to avoid steam cleaners, and ultrasonic cleaners are typically safe to use. Who Can Wear Anahi Ametrine? The trend of color-blocking has returned to the fashion world. There is now greater demand for multi-color gems like ametrine, tourmaline, fluorites and agates; gems known for their phenomenon of color zoning and banding. No matter what the current fashion trends might be, fascinating multi-color gems like ametrine are sure to endure and always delight. Despite being quite rare and sourced from only one locality, prices for Ametrine are still very affordable. Color zoning happens naturally and no two ametrine are alike. Being affordable and unique, Anahi ametrine makes a great choice for fans looks for an alternate color palette to tourmaline’s pink and green. The gem wears well for both day and evening gatherings. How Does Anahi Ametrine Compare to Other Stones? 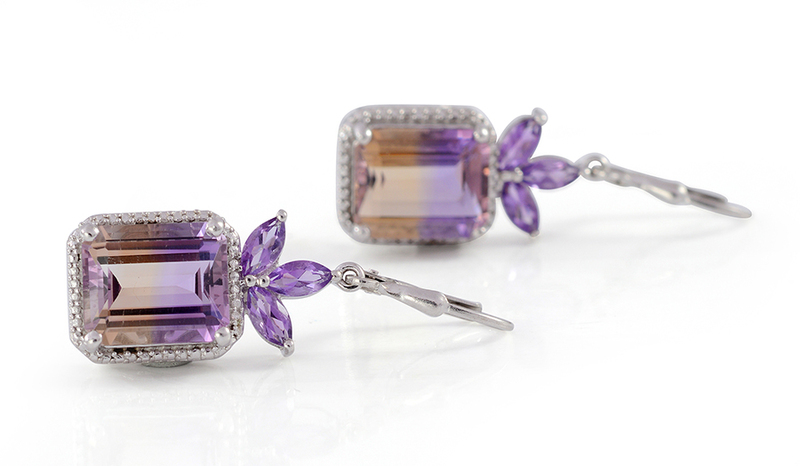 When you compare Anahi ametrine to other stones, the main difference you’ll see is color. 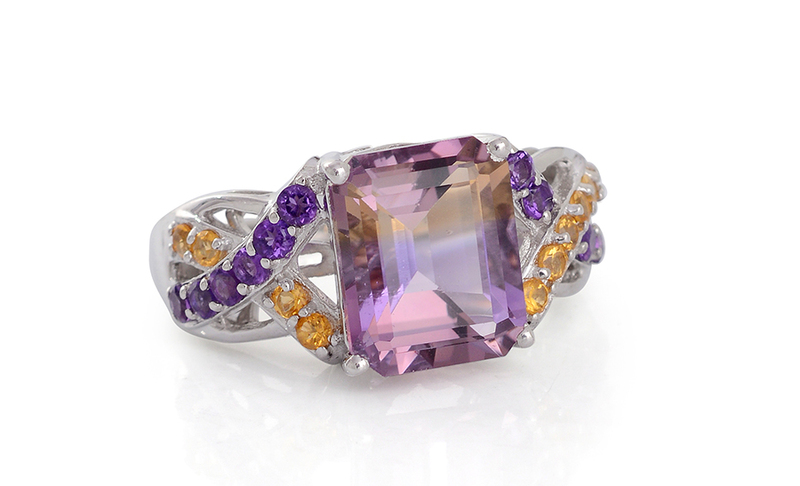 The gem combines the beautiful hues of both amethyst and citrine. The contrasting colors are typically distinct with sudden transitions. Similar color zoning can be observed in gems like watermelon tourmaline displaying a pink and green combination and bi-color fluorite with violet and blue colors. Where Does Anahi Ametrine Come From? The Anahi Mine in Bolivia is the top global producer of ametrine. Popular lore tells us that during the 17th century, the mine was a wedding gift to a Spanish conquistador upon marrying the princess of the Ayoreos tribe. The mine is named in her honor. Ametrine later came to Europe as gifts presented by the conquistador to the Spanish queen. After that, the mine was lost for more than three centuries. Rediscovered in the 1960s, the mine’s ametrine began appearing on the market again during the 1970s. Shop LC is proud to share this unique and beautiful gemstone with customers at affordable prices. How is Anahi Ametrine Mined? The Anahi mine is the only commercial source of ametrine in the world. The mining area is remote and the commute to and from the mine is done by a small airplane or by a combination of roads and boats. The area is lined with chunks of different sizes of quartz, including outright hexagonal crystals. The hills surrounding the mine property consist of dolomitic limestone, containing veins of quartz. Several reinforced shafts and horizontal tunnels have been drilled along these veins for underground mining. With most of the mining at Anahi done underground, there is also a small open-pit mining area. Dynamite blasting occurs once or twice per day to assist enlargement of tunnels loosening up of mineralized areas in the open pit for hand digging. The loosened rock is removed and transported up an elevator shaft and slid down a chute to another waiting mining cart in open air. The material is then dumped at a washing area where a water cannon further loosens masses of rock and mud, and a series of sieves are used to separate out particulate matter. This process then moves to presorting, where rough is hammered to separate facetable material. What Does Anahi Ametrine Mean? Ametrine is considered by some as a healing stone that can be used to clear one's thoughts and spiritual being. It has also been credited with aiding cleansing on a physical level. Its ability to awakening one's mental and creative prowess makes it a great gift for students, particularly those with scheduled exams. Ametrine may help ease negativity stress and tension and is believed to boost the immune system and energy. Is Anahi Ametrine a Birthstone? Anahi ametrine is not recognized as a modern birthstone. However, gemstone lovers born in February and November can both claim ametrine as an alternative birthstone as its composition contains both amethyst and citrine! Ranks seven on the Mohs scale of hardness. Colors displays a distinct blend of purple and golden yellow. Sourced from the Anahi mine of Bolivia. Ametrine occasionally undergoes heat treatment to improve color. Also known as trystine or bolivianite.